The key to growth in the rebound is innovation in existing and new products. But product innovation cycles need to be fast and aligned with market trends. With transparency comes cross-team alignment and that leads to agility. Transparency into the entire product management process is a good thing. It aligns dispersed cross-organizational teams and it keeps product strategy and execution aligned with company goals. But what is transparency and how do you get it? 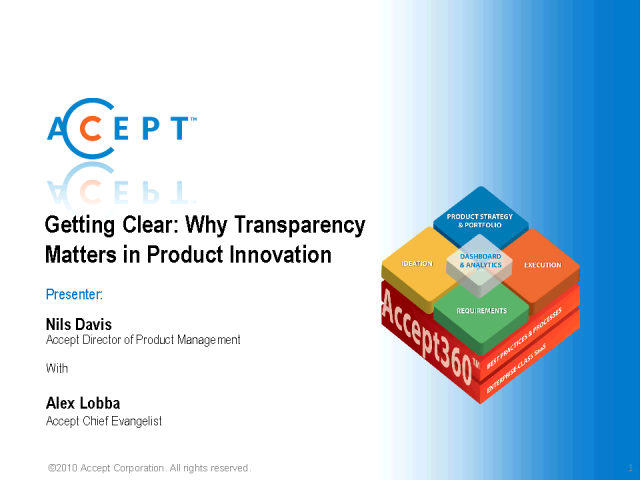 Join us for this webinar to learn how to achieve transparency, the best practices and what tools are needed in your environment to bring more profitable products to market faster. -Ensure that every product release maps to market and strategic needs and product alignment occurs with market changes.